The interplanetary shock/electric field event of 5–6 November 2001 is analyzed using ACE interplanetary data. The consequential ionospheric effects are studied using GPS receiver data from the CHAMP and SAC-C satellites and altimeter data from the TOPEX/Poseidon satellite. Data from ∼100 ground-based GPS receivers as well as Brazilian Digisonde and Pacific sector magnetometer data are also used. The dawn-to-dusk interplanetary electric field was initially ∼33 mV/m just after the forward shock (IMF BZ = −48 nT) and later reached a peak value of ∼54 mV/m 1 hour and 40 min later (BZ = −78 nT). The electric field was ∼45 mV/m (BZ = −65 nT) 2 hours after the shock. This electric field generated a magnetic storm of intensity DST = −275 nT. The dayside satellite GPS receiver data plus ground-based GPS data indicate that the entire equatorial and midlatitude (up to ±50° magnetic latitude (MLAT)) dayside ionosphere was uplifted, significantly increasing the electron content (and densities) at altitudes greater than 430 km (CHAMP orbital altitude). This uplift peaked ∼2 1/2 hours after the shock passage. The effect of the uplift on the ionospheric total electron content (TEC) lasted for 4 to 5 hours. 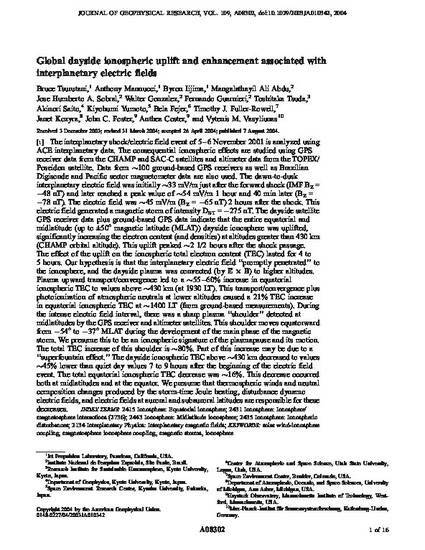 Our hypothesis is that the interplanetary electric field “promptly penetrated” to the ionosphere, and the dayside plasma was convected (by E × B) to higher altitudes. Plasma upward transport/convergence led to a ∼55–60% increase in equatorial ionospheric TEC to values above ∼430 km (at 1930 LT). This transport/convergence plus photoionization of atmospheric neutrals at lower altitudes caused a 21% TEC increase in equatorial ionospheric TEC at ∼1400 LT (from ground-based measurements). During the intense electric field interval, there was a sharp plasma “shoulder” detected at midlatitudes by the GPS receiver and altimeter satellites. This shoulder moves equatorward from −54° to −37° MLAT during the development of the main phase of the magnetic storm. We presume this to be an ionospheric signature of the plasmapause and its motion. The total TEC increase of this shoulder is ∼80%. Part of this increase may be due to a “superfountain effect.” The dayside ionospheric TEC above ∼430 km decreased to values ∼45% lower than quiet day values 7 to 9 hours after the beginning of the electric field event. The total equatorial ionospheric TEC decrease was ∼16%. This decrease occurred both at midlatitudes and at the equator. We presume that thermospheric winds and neutral composition changes produced by the storm-time Joule heating, disturbance dynamo electric fields, and electric fields at auroral and subauroral latitudes are responsible for these decreases. Tsurutani, B. R., A. Mannucci, B. Ijima, A. Saito, K. Yumoto, M. A. Abdu, J. H. A. Sobral, W. D. Gonzales, F. L. Guarnieri, T. Tsuda, B. G. Fejer, T. J. Fuller-Rowell, J. U. O. Kozyra, J. C. Foster, A. Coster, and V. M. Vasyliumas, Global dayside ionospheric uplift and enhancements due to interplanetary shock electric fields, J. Geophys. Res., 109, A08302, doi: 10.1029/2003JA010342, 2004.